The Wright brothers' "Flyer" takes to the air, 10:35 AM, December 17, 1903. In the middle years of the 1890s, the world was trembling on the brink of breakthroughs and breakdowns, and so was the no-longer-quite-young chemist, Svante Arrhenius. The Victorian age, with its optimistic complacency and its Pax Brittanica, was drawing to a close. The Colonial system was entering the first, barely perceptible, stages of breakdown as Britain fought the bloody Boer War in southern Africa; the German Kaiser’s jeers from the sidelines—and still more the German challenge to British naval superiority—was forcing a political realignment that would set the sides for the First World War. And the Steam Age was beginning its metamorphosis into the Oil Age. As to Arrhenius, he was entering well and truly into middle age—though still regarded as a “young Turk” by many of his elders in the world of chemistry. He had overcome the obstacle put in his way when his Doctoral dissertation received the lowest possible passing grade in 1884. His examiners had not understood that his ideas about ionic dissociation in solutions would become essential to the development of chemistry over the following decades; nor could they envision the Nobel prize which he would later win. (Indeed, Nobel prizes did not yet exist.) With limited prospects, but convinced of the correctness and importance of his concepts, Arrhenius had done six years of postdoctoral study, traveling widely across Europe and sharing his ideas with receptive researchers. His reputation slowly increased, and he was finally able to take a position as a lecturer in Stockholm in 1891. One of his students was Sofia Rudbeck. 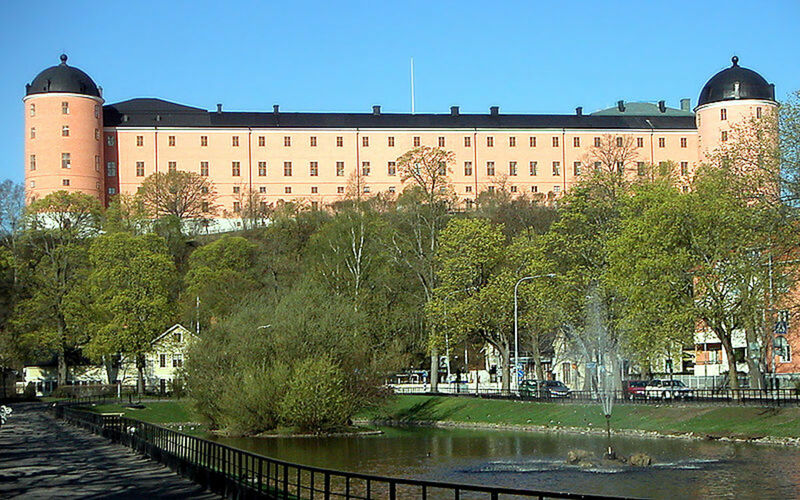 She was beautiful and gifted--one of the first Swedish women to obtain a Bachelor’s degree in science--and became the first female member of the Geological Society of Stockholm. She and Arrhenius were married in 1894. The following year, Arrhenius was promoted to a Professorship, and perhaps it seemed to him that his life was unfolding as it should. As is so often the case, things would not be quite so simple; one of the pending breakdowns would be that of his marriage, and it would be intimately tied to a breakthrough in the science of climate change. 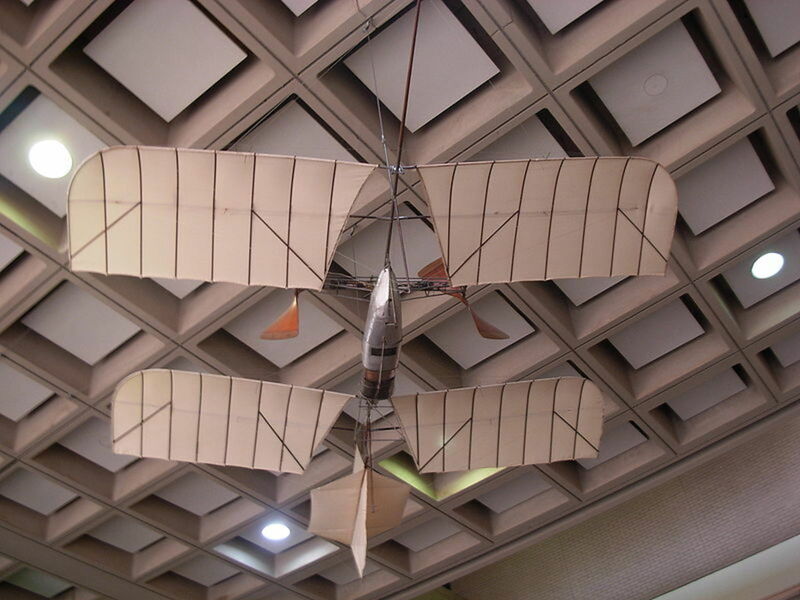 One of the most striking of all the pending breakthroughs, though, would be in the development of powered flight. 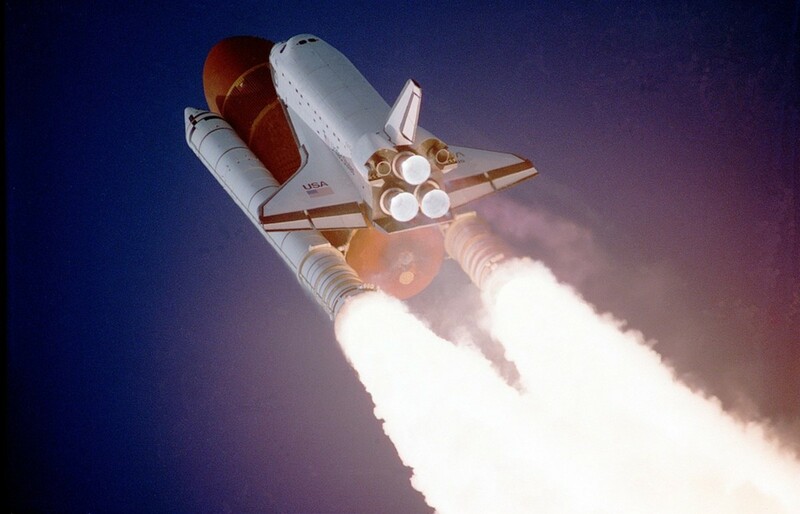 Of course, the Wright brothers’ first successful flights were still nearly a decade in the future--but Samuel Langley had his greatest aeronautic success in the mid-90s. 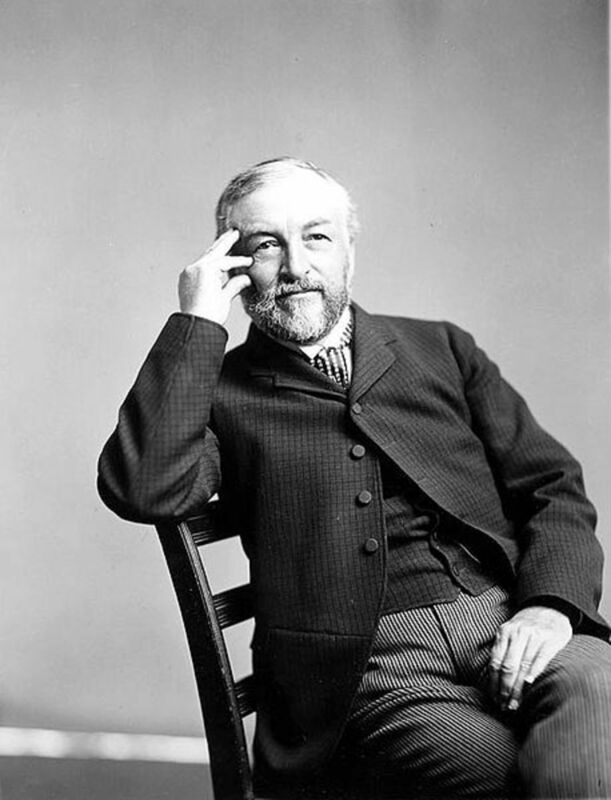 Langley was director of the Smithsonian Institution, and a prominent scientist. As with many nineteenth-century savants, his interests were diverse, but he spent fifteen years and considerable sums of money—some his, some coming from the US Department of Defense—with the object of achieving human flight. As the picture shows, he came close. 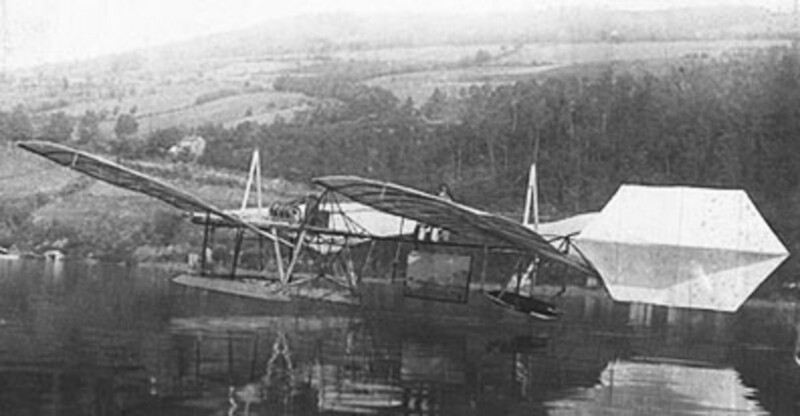 The flight took place on May 6, 1896, above the Potomac River. The “aerodrome,” as Langley called his flying machine, was an unpiloted model, and is credited as "the first powered heavier-than-air machine to attain sustained flight." On this occasion its flight covered a circular path of approximately 3,300 feet. It is telling that the photo was made by Langley’s colleague, Alexander Graham Bell—the man who invented the telephone! Such was the interest aroused by Langley’s experiments. Another, earlier part of Langley’s work affected Arrhenius deeply during the dark days of 1895. The intensity of his romance with Sofia had burned out, leaving the reality of two deeply incompatible personalities. She—by now carrying their son, Olof—left him, to live alone on an island near Stockhom, writing letters telling Arrhenius how much happier she was without him. He was fortunate to have an engrossing task to help carry him through the stresses of separation and divorce. His work on ionic chemistry was by this time reaching widespread scientific acceptance—though the complete victory of “the ionists” was still in the future. But basically the battle was won, and now he needed something else to do, scientifically speaking. The new problem turned out to be the development of a chemical solution to a geological problem. 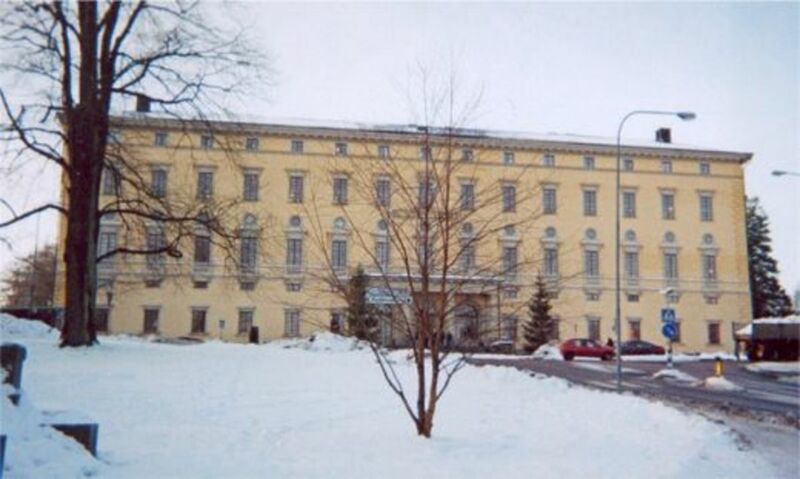 It is tempting to speculate that Sofia’s geological interests may have had some connection with his choice, but the known connection is with Arrhenius’s friend, the geologist Arvid Högbom. Högbom was interested in what we now call the carbon cycle—the movement of carbon between ocean, atmosphere, biosphere, and the earth’s crust. He believed (correctly, but not in accordance with then-prevailing ideas) that atmospheric concentrations of CO2 might have varied widely over geological ages. Following up on this insight, Arrhenius posed this research question: how much variance in atmospheric CO2 levels would be necessary to account for the dramatic changes in glaciation that paleogeologists had discovered? In other words, could CO2 account for the ebb and flow of the ice ages? 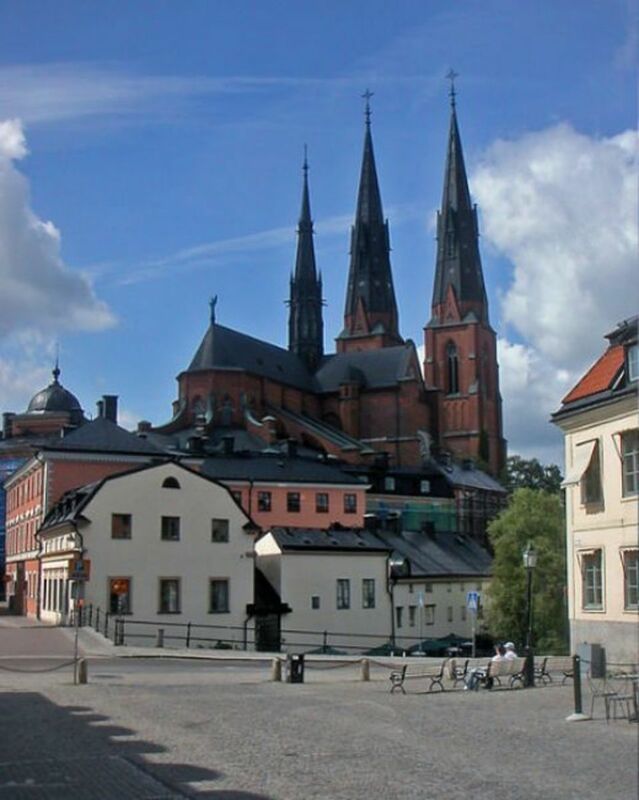 Uppsala images, courtesy Wiki Commons. 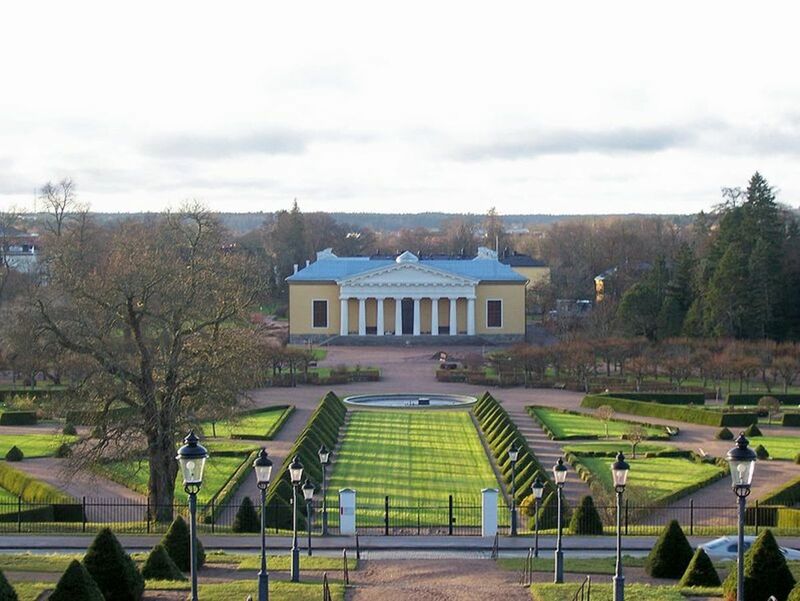 Uppsala University Botanical Garden. Image by cyberjunkie. Arrhenius approached this question in a manner that turned out to be characteristic of his later work. Born February 19, 1859, at Vik, near Uppsala, Sweden, he had taught himself to read by the age of three, and had also grown up watching his father--a surveyor and overseer--use large tables of numbers in his work. The younger Svante had either developed or inherited a great facility in remembering, manipulating, and understanding numerical representations of real-world phenomena. Arrhenius's main researches in electrolytic chemistry showed him also to be an experimenter capable of meticulous and patient lab work--but from the mid-1890s he would frequently choose to reanalyze data obtained by others. In this case, he would choose Samuel Langley’s observations of the spectrum of moonlight. Langley--born in Roxbury, Massachusetts, in 1834--was an astronomer by trade. He had trained at the Harvard Observatory and taught at the Naval Academy, and in 1867 became the director of the Allegheny Observatory. He is credited with initiating the first true research programs there. He also raised money to support the Observatory by creating a commercial subscription time-standard used by railroads and distributed via telegraph. 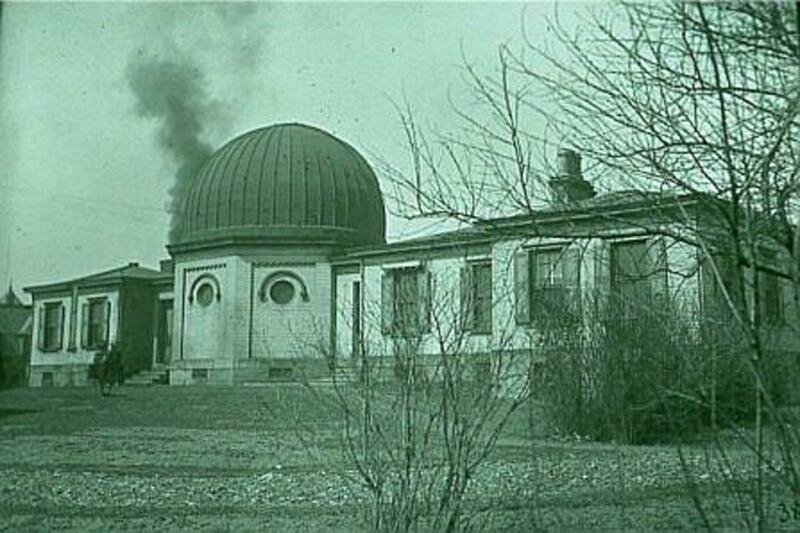 An historic view of the Allegheny Observatory, courtesy Allegheny Observatory. 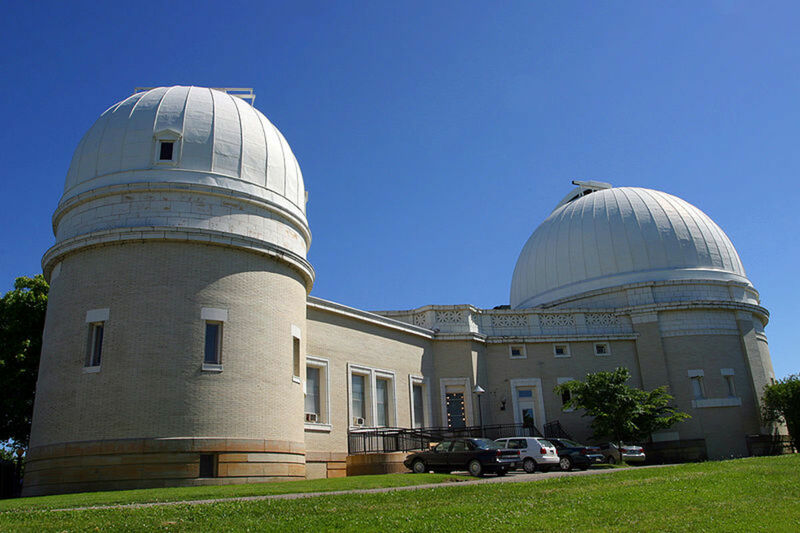 The Observatory in 207, courtesy Tom Murphy VII and Wikipedia. His last major research initiative there, before he became head of the Smithsonian Museum, consisted of investigation of the temperature of the Moon. 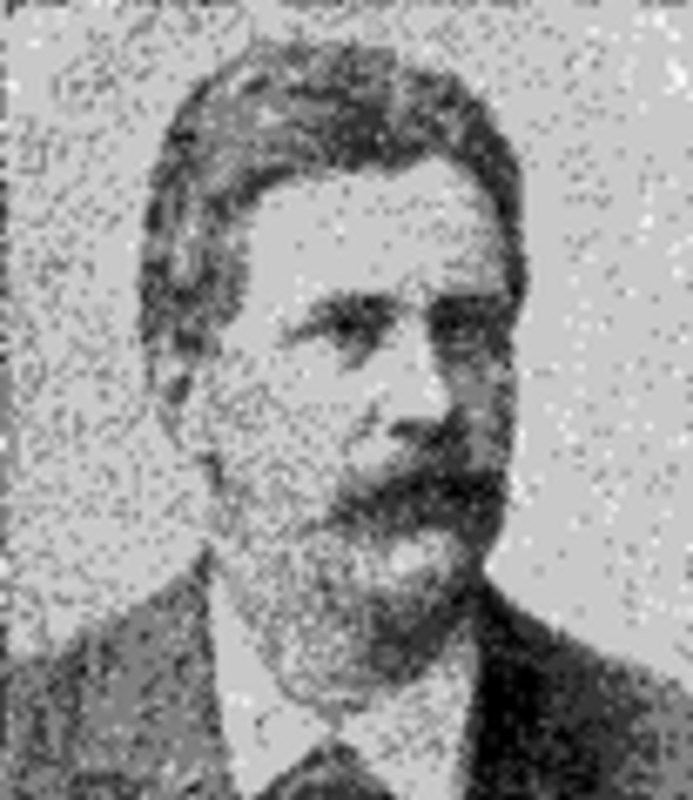 As part of this project he published a paper detailing infrared band observations made by himself and Frank Washington Very from 1885 to 1887. Because these observations, made at different places and times, involved transit of various wavelengths of infrared radiation through longer and shorter paths through the atmosphere, Arrhenius was able to use them to tease out the atmospheric absorptivity of CO2 over varying conditions. 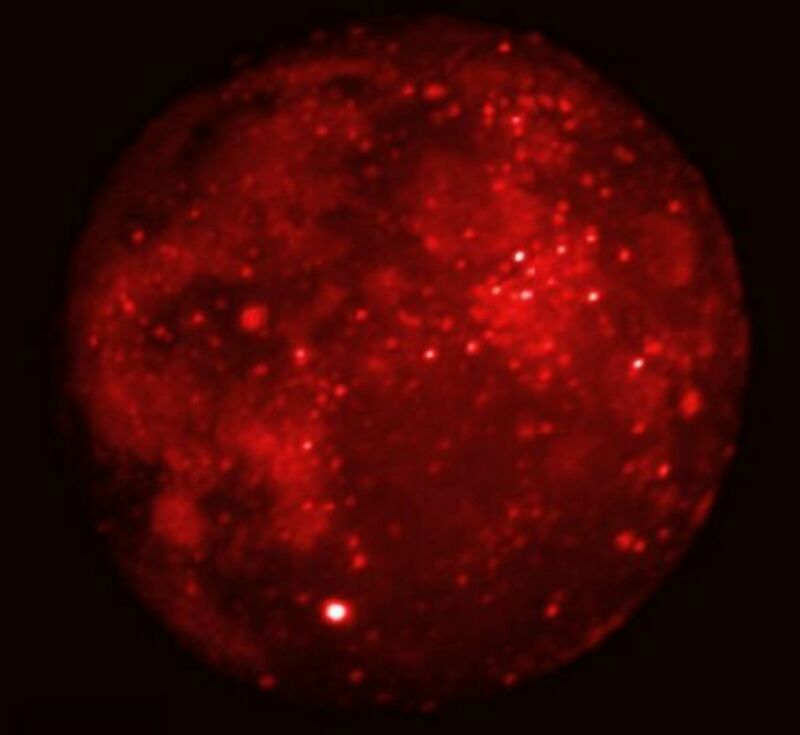 A modern infra-red image of the Moon. Image courtesy the DCATT Team, MSX Project, BMDO. But the heart of his paper is the construction from published metereological data of a table of mean temperature and relative and absolute humidity for the surface of the earth between 60 degrees south and 70 degrees north. This table gave data for nearly three hundred 10 by 20 degree "districts" and was surely responsible for a good proportion of what Arrhenius referred to as "tedious calculations." This table was then used as the basis for a final table giving the temperature change resulting from specified changes in the concentration of "Carbonic Acid"--carbon dioxide, as we now call it--in the atmosphere. Again, the changes were specified for the "districts" described above. A cartoon of Arrhenius. Note the plus and minus symbols on the croquet balls, a reference to the positive and negative ions Arrhenius identified as occurring in electrolytic solutions, as well as to the playful side of Arrhenius's personality. This deceptively simple-appearing set of tables constitutes the first model of Terrestrial climate. A far cry from today's "Global Climate Models"--which often take nearly as long to run their calculations on today's most advanced supercomputers as Arrhenius took to do his calculations by hand--it nonetheless anticipates their results in significant ways. Firstly, it allowed Arrhenius to predict the pattern of greenhouse warming. He wrote, "the influence [of CO2] has a minimum near the equator, and increases from this to a flat maximum that lies the further from the equator, the higher the quantity of carbonic acid in the air. . . The influence is in general greater in the winter than in the summer. . . greater for land than for ocean. . . the effect will be less [in the Southern hemisphere] than in the Northern. . . An increase in the quantity of carbonic acid will of course diminish the difference in temperature between day and night." All of these patterns have in fact been observed by meteorologists and climatologists over the three decades of the "warming era." Secondly, it formulates the rule of thumb--still used--that "if the quantity of carbonic acid increases in geometric progression, the augmentation of the temperature will increase nearly in arithmetic progression." Today, for example, the idea of "climate sensitivity" is usually stated in terms of the amount of warming produced by a doubling of the CO2 concentration. 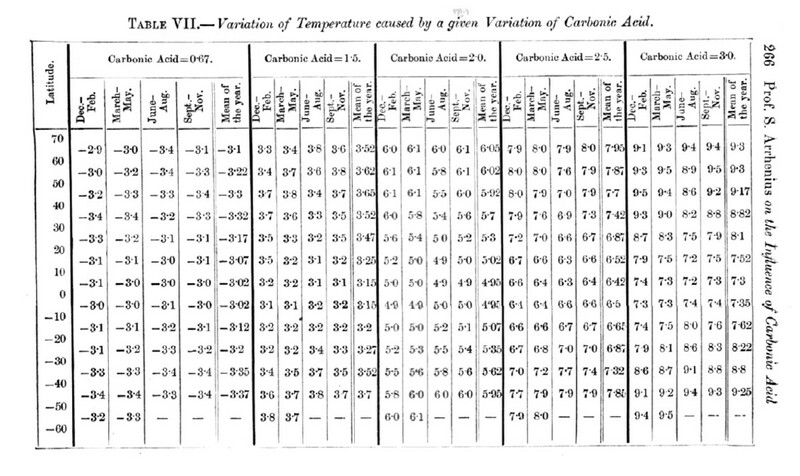 Arrhenius's Table VII, giving seasonal temperature changes for differing levels of CO2. Note that this is a synoptic version of the table; the full table calculates separate values for each 20 degrees of longitude, and is hence 18 times larger. 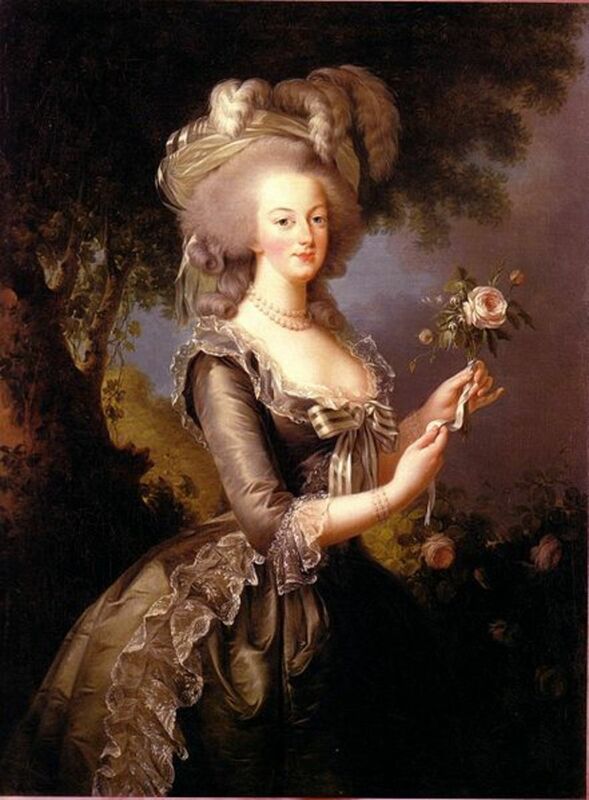 I have thus far had only a purely scientific interest in the results of these labors. Perhaps if it could have been foreseen at the outset how much labor there was to be, how much of life would be given to it, and how much care, I might have hesitated to enter upon it at all. And now reward must be looked for, if reward there be, in the knowledge that I have done the best I could in a difficult task, with results which it may be hoped will be useful to others. 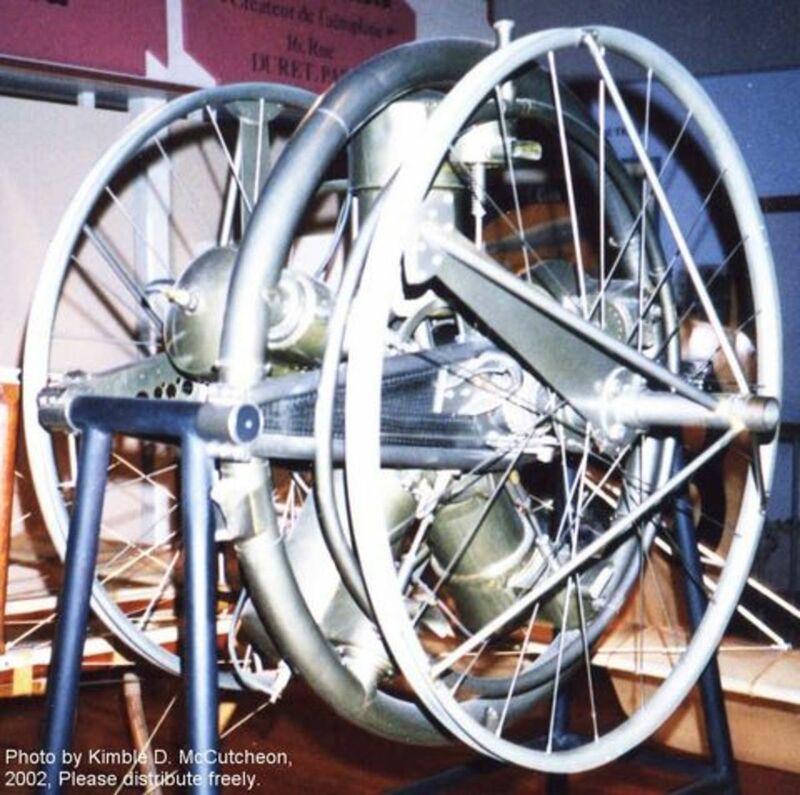 I have brought to a close the portion of the work which seemed to be specially mine - the demonstration of the practicability of mechanical flight. . . But it was not to be quite so simple for either man. For Arrhenius, there was a muted reaction from the geological community, followed by a controversy with Knut Angstrom, whose data Arrhenius had used, and who in 1900 published more detailed spectrographic data on CO2. 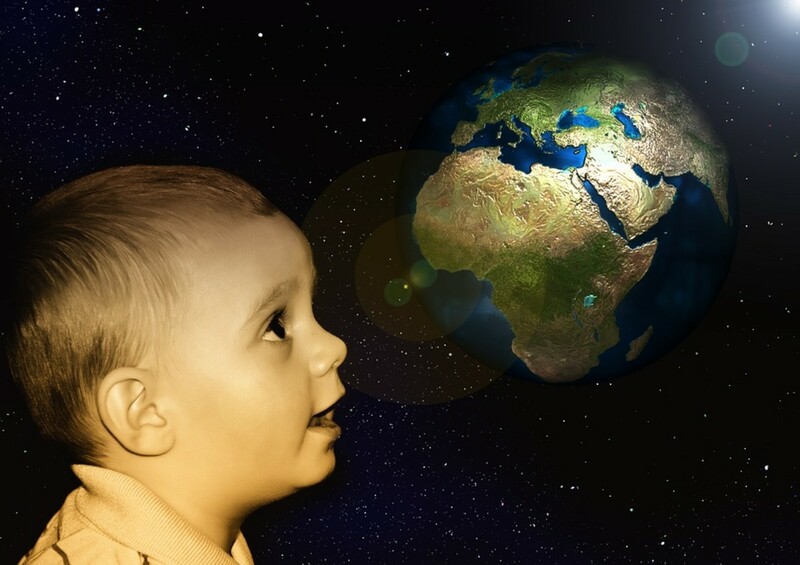 (This controversy resonates to the present day, as some controversialists attempt to resurrect Angstrom's argument as a rebuttal of the theory of anthropogenic warming.) For Langley, there would be a new chapter of aeronautical research, as President McKinley requested that Langley investigate whether the aerodrome could be scaled up to carry a human pilot. It was this request that led to the $50,000 grant from the War Department. The grant was to cover costs only; Langley did not profit personally. 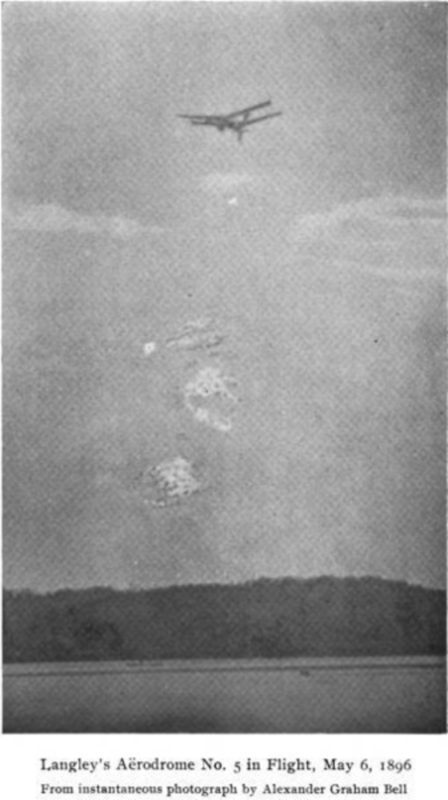 Langley's first failure in manned flight, October 7, 1903. 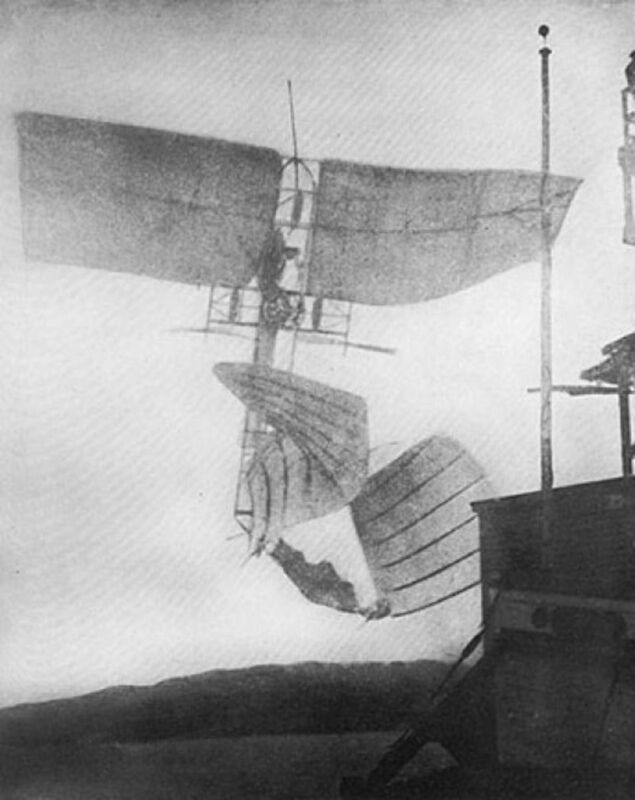 Langley's second failure in manned flight, December 8, 1903. The Manley-Balzer engine. Photo courtesy of Kimbel McCutcheon. It is unfortunate that Langley did not take full advantage of this power; had he done so, he could have eliminated the stress to the airframe caused by the high acceleration of his catapult launcher, and thereby increased his machine's chances of surviving takeoff. As it was, there were two disastrous--and very public--attempts to launch "The Great Aerodrome," followed by a storm of criticism and ridicule which ended Langley's experiments. 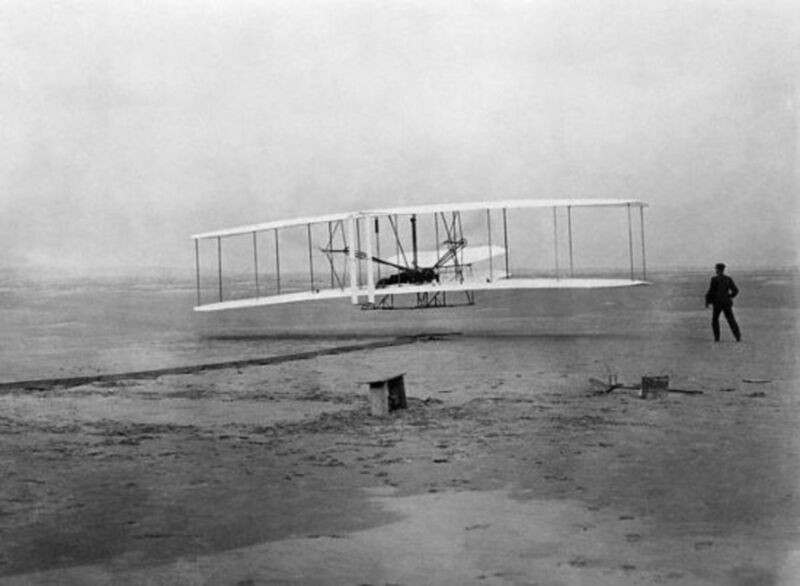 Just nine days after the second failure, the Wright brothers made their first powered flight at Kitty Hawk. Their flyer had cost them about $1,000. The old astronomer died in 1906, following a series of strokes. Curiously, his aerodrome would eventually fly. 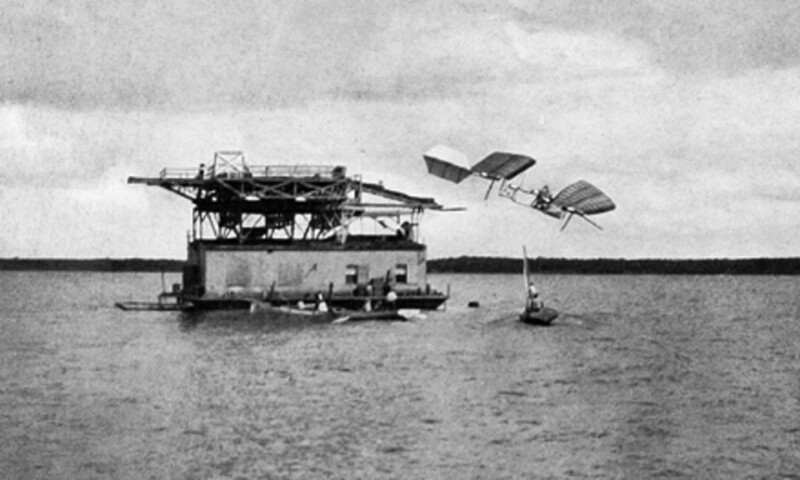 As part of Glen Curtiss's attempts to break the Wright's patents, Curtiss modified the Aerodrome until it could make a successful test flight in 1914. The Curtiss-modified "Great Aerodrome" finally flies, September 1914. By contrast, the trajectory of Arrhenius's fortunes was largely upward. He became Rector of the Stockholm Högskola in 1897; was elected to the Swedish Academy of Sciences in 1901; and was awarded the third Nobel Prize for Chemistry in 1903, sharing the limelight with the trio of Henri Becquerel and Pierre and Marie Curie, who won in Physics. He was invited to set up and lead the new Nobel Institute for Physical Chemistry in 1905; he would remain Director essentially up to his death on October 2, 1927, and would be deeply involved in the Nobel process during this period. His last graduate student at the Institute laboratory, the American Dr. Hubert Alyea, worked and studied there in 1925-26. 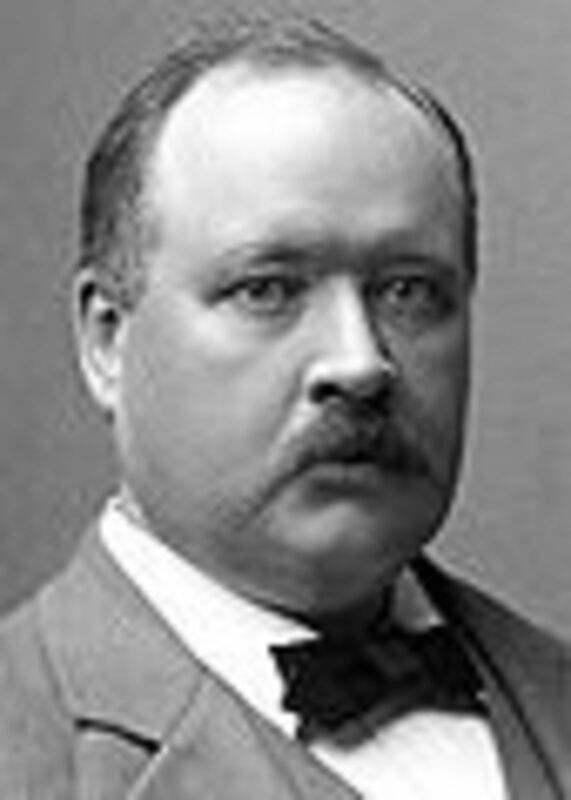 It was also in 1905 that Arrhenius married his second wife, Maria Johansson, with whom he would have three more children. Although the First World War troubled Arrhenius personally--he was friendly with many scientists on both sides of the conflict, and worked successfully to repatriate those who had been made prisoners of war--he is said to have been contented with both work and family throughout the last decades of his life. (Alyea characterized Arrhenius as a man who "spread joy in the lab.") He lectured abroad (notably at the University of California) and wrote both scholarly and popular books on a wide variety of topics, from immunochemistry to cosmology. He received numerous other honors, including eight honorary degrees, Fellowship in the Royal Society, and the Davy and Faraday medals. Nobel images around the world. 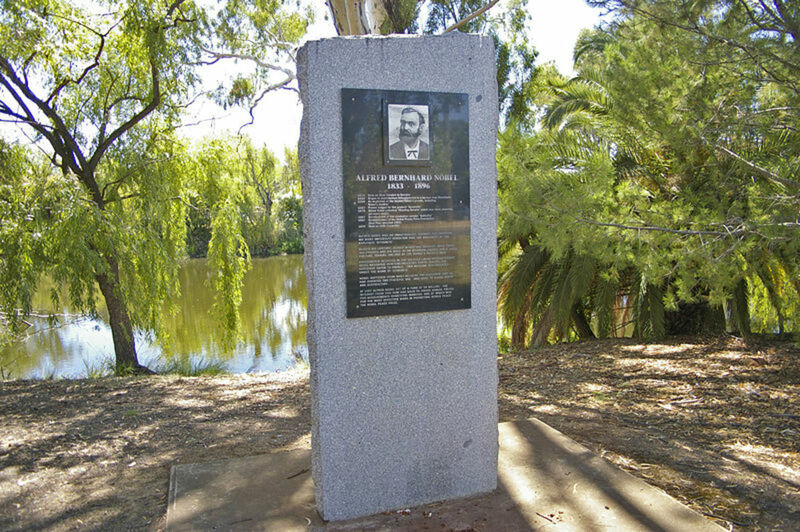 Nobel memorial, Wagga Wagga, New South Wales, Australia. Image courtesy Bidgee and Wikipedia Commons. 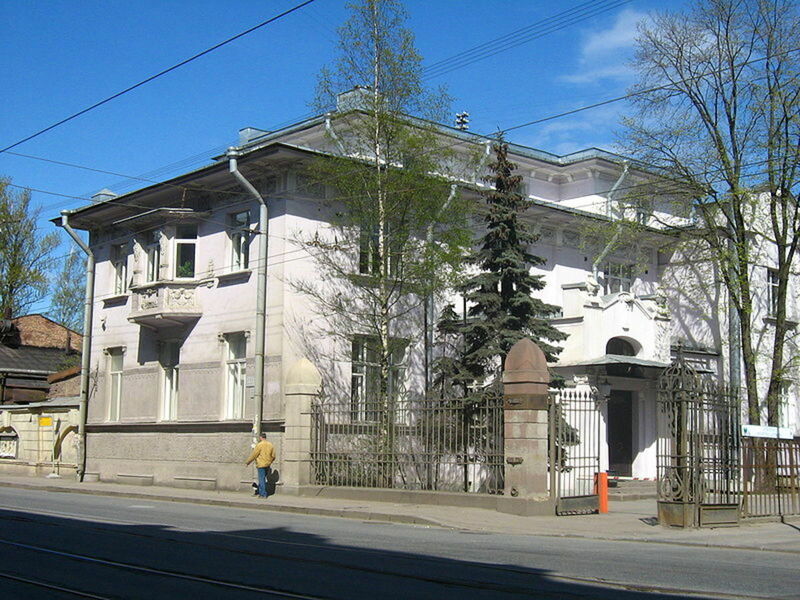 Nobel family home, St. Petersburg, Russia. Image courtesy Maryanna Nesina and Wikipedia Commons. 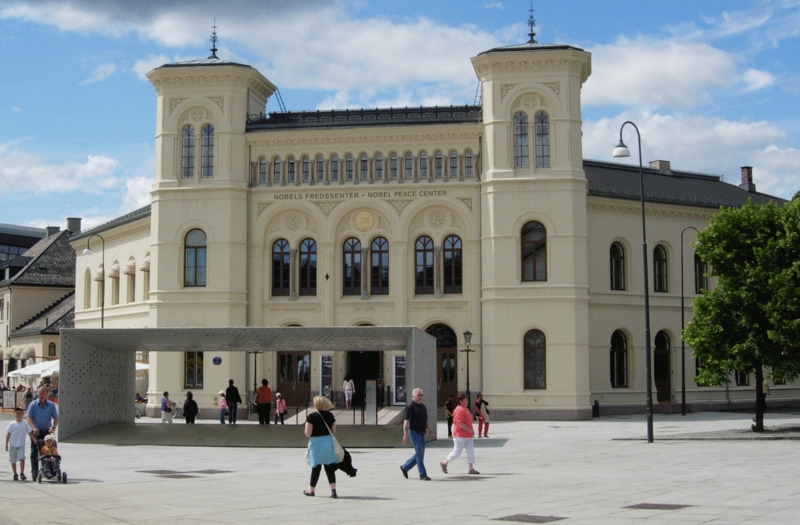 Nobel Peace Center, Oslo. Image courtesy Dirk Hamburg and Wikipedia Commons. 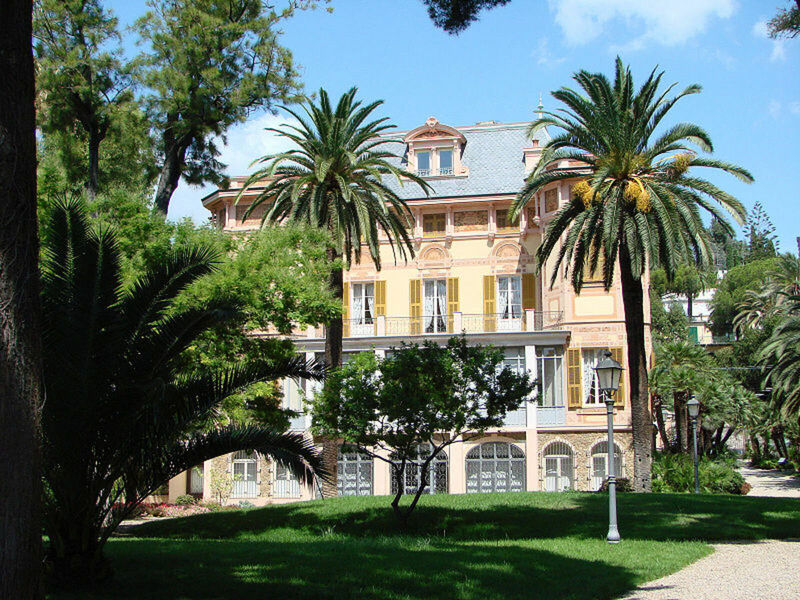 Nobel's villa, San Remo, Italy. Image courtesy Samuele and Wikipedia Commons. 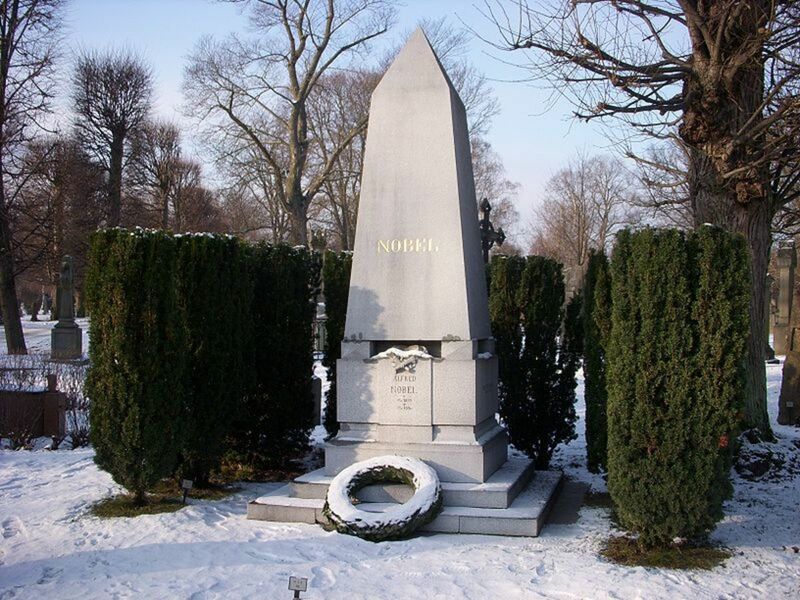 Nobel's grave, Stockholm. 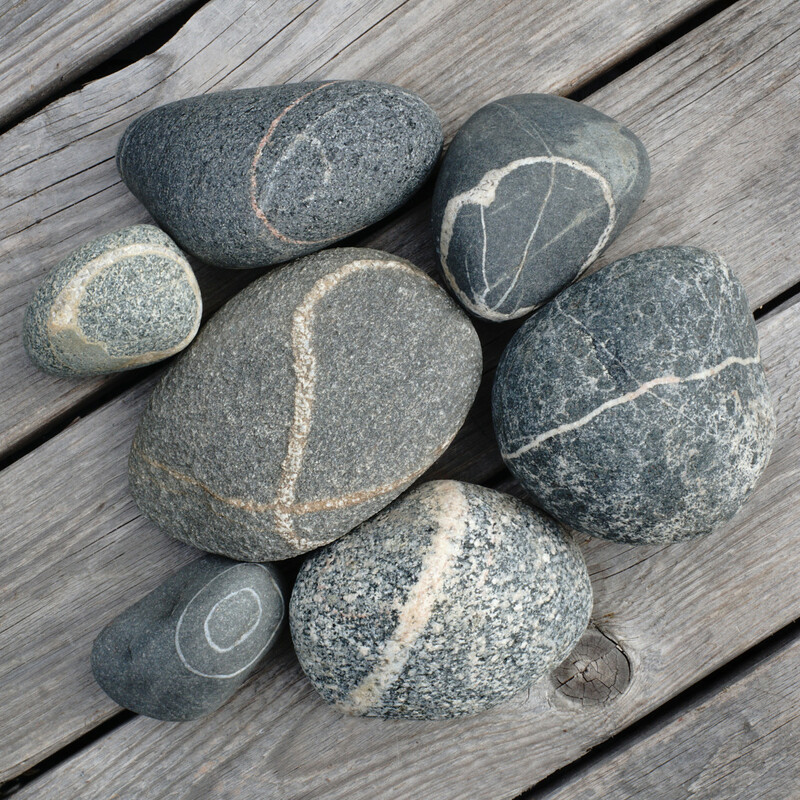 Image courtesy Holger Ellgaard and Wikipedia Commons. Although Arrhenius's theory that CO2 drives glacial advance and retreat did not achieve widespread acceptance until the 1960's--and only then by its modification to include the influence of the natural cyclic orbital changes as calculated by Milutin Milankovitch--it was important in several ways. Firstly, his work carried forward and greatly developed the ideas of Fourier, Pouillet, De Marchi, and Tyndall. Secondly, it inspired further researches, such as those carried out by Guy Stewart Callendar between 1938 and 1964. Thirdly, it was broadly correct--despite the numerous simplifying assumptions that the state of the art required him to make. Well, my grandfather rang a bell, indeed, and people became extremely interested in it at that time. There was a great flurry of interest in it, but not because of the menace but because it would be so great. He felt that it would be marvelous to have an improved climate in “the northern climes.” And in addition, the carbon dioxide would stimulate growth of crops—they would grow better. So he was--he and people at the time were--not unhappy about the prospects. They were only sad that in his calculations it would take about 300 years for it to have the marked effect that we now think would happen in something like thirty or forty years. The demonstration no possible combination of known substances, known forms of machinery, and known forms of force can be united in a practicable machine by which men shall fly long distances through the air, seems to the writer as complete as it is possible for the demonstration of any physical fact to be. The growth of military aviation. Handley-Page Type O/400--max bomb payload, 2,000 lbs. Last production ca. 1918. Image courtesy Wikipedia. B-29--max bomb payload, 20,000 lbs. Last production 1946. Image courtesy Wikipedia. 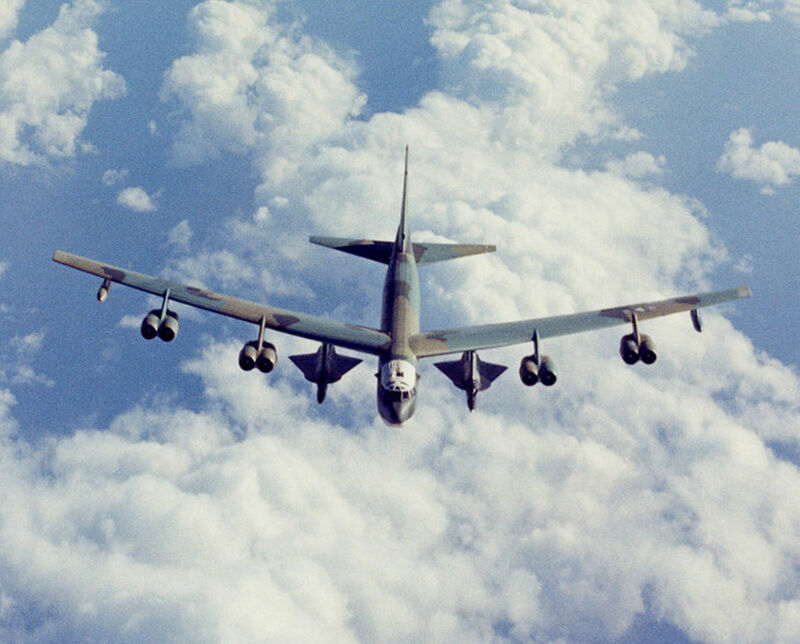 B-52H--max bomb payload, 70,000 lbs. Last production 1962. Image courtesy Wikipedia. 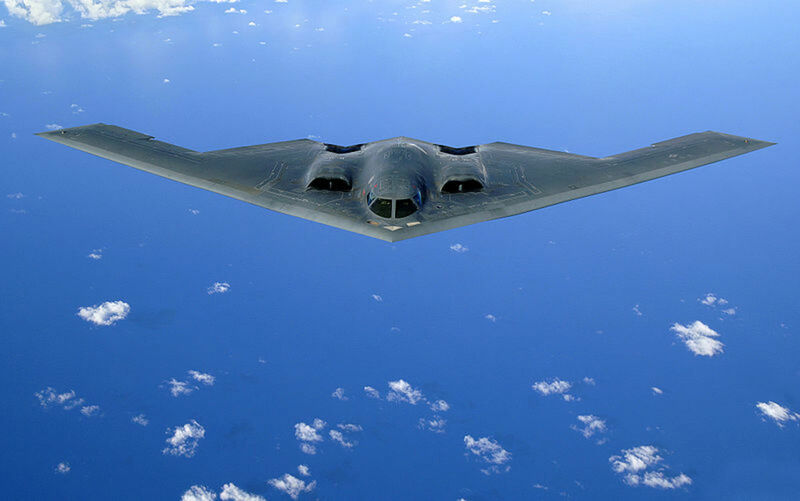 B-2--max bomb payload, 50,000 lbs. Last production 1997. Image courtesy Wikipedia. Few foresaw the intensity or scale of the wars of the twentieth century, or the place which air power would take. Wells was one exception. In addition to his 1902 prediction in Anticipations of military aviation by 2000 and "probably" by 1950, his The War in the Air (1908) foresaw German airships taking command of the skies to deliver a devastating terror bombing attack on New York city. But while The War in the Air envisioned a grinding 30-year war ending in the destruction of technological civilization, in reality war actually spurred technological development to a pace more fantastic than even Wells' insight and imagination could envisage. This machine may even carry mail in special cases. But the useful loads will be very small. The machines will eventually be fast, they will be used in sport, but they are not to be thought of as commercial carriers. Fifteen years later, the Handley-Page 0/400 was carrying 2000 pounds of bombs. 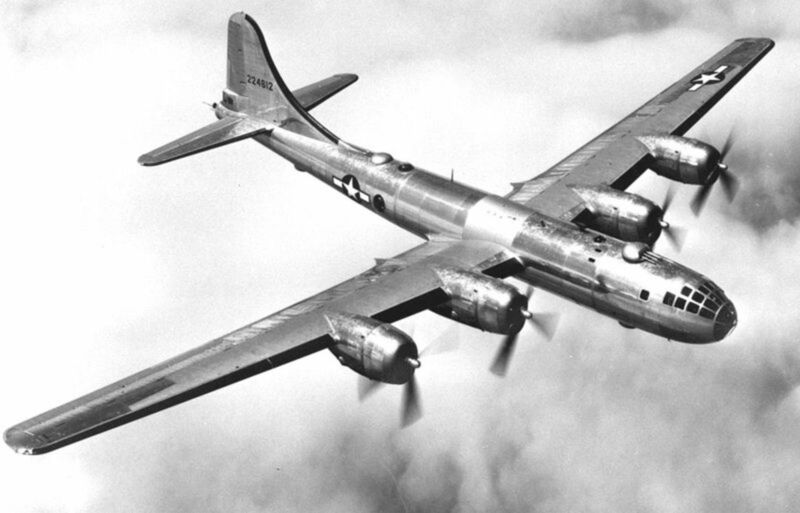 Forty-five years later--still sooner than Wells had initially envisioned military aviation existing--the B-29 had multiplied that capacity by a factor of 10. Within another 10 years, the first models of the B-52 were carrying three times that; and by 1990, the B-2 was carrying slightly smaller (but even more deadly) bomb loads at supersonic speeds anywhere in the world. 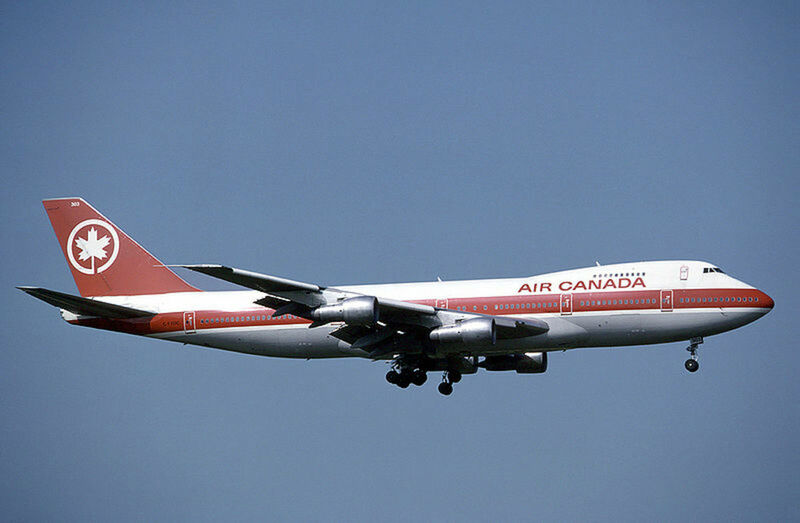 An Air Canada 747. Image courtesy Eduard Marmet and Wikipedia Commons. 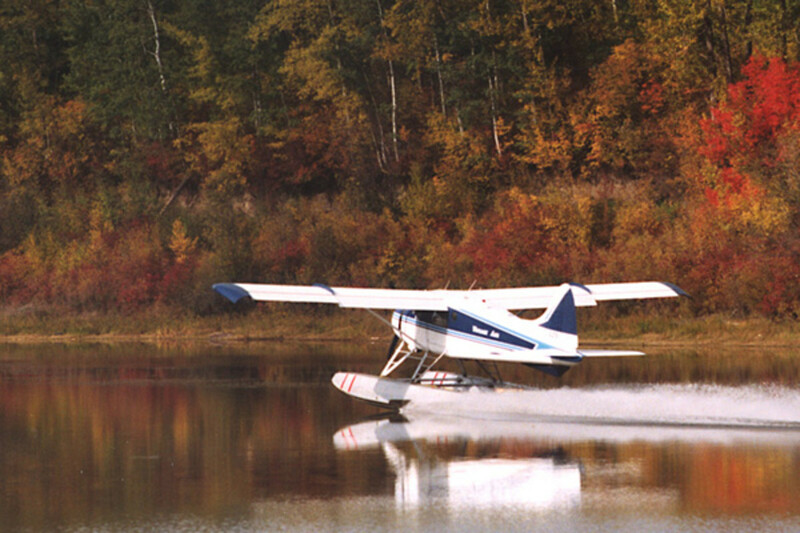 A DeHavilland Beaver bush plane takes off near Fort MacMurray, Alberta. Image courtesy of the Regional Municipality of Wood Buffalo and Wikipedia Commons. 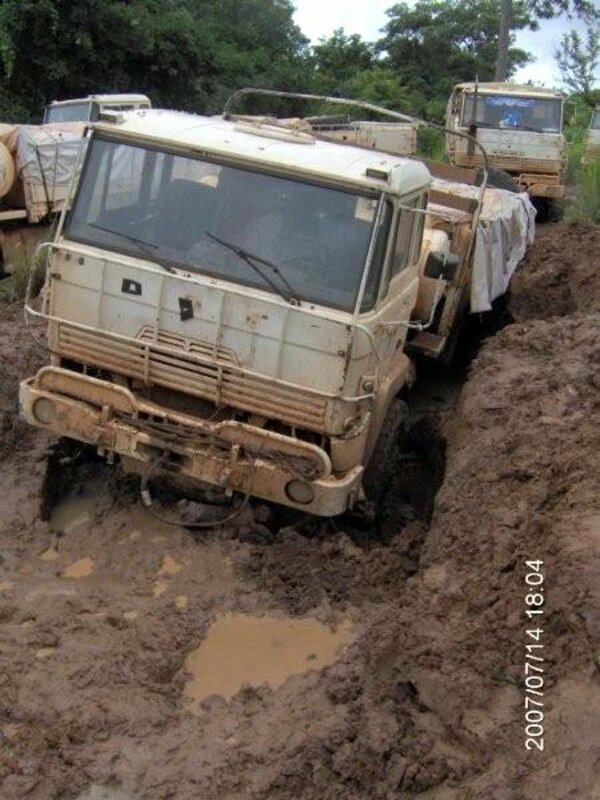 Food convoy in the Central African Republic. Image courtesy hdptcar and Wikipedia. 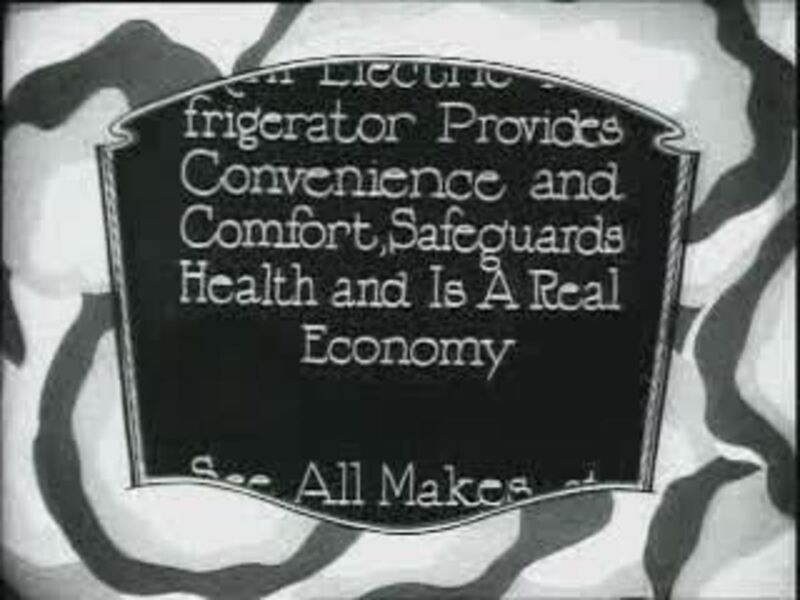 Old movie commercial for electric refrigerator. Image courtesy Wikipedia. 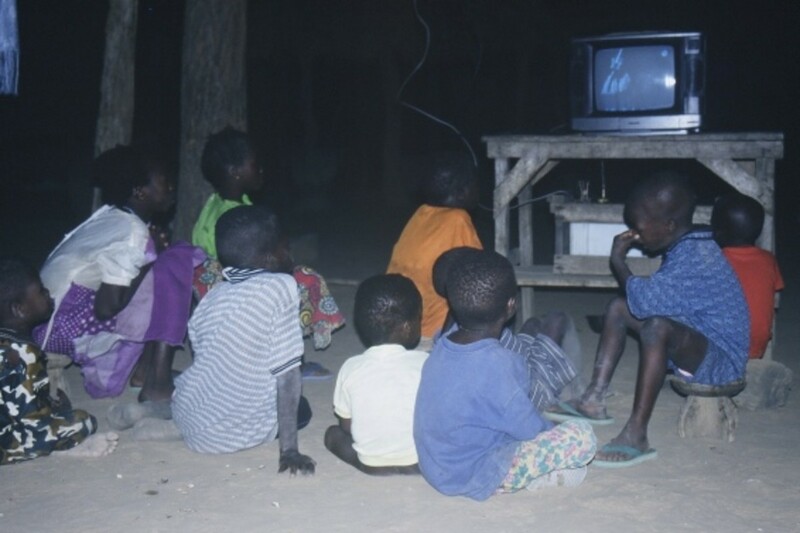 Children in Mali watch television. Image courtesy Olivier Keite and Wikipedia. 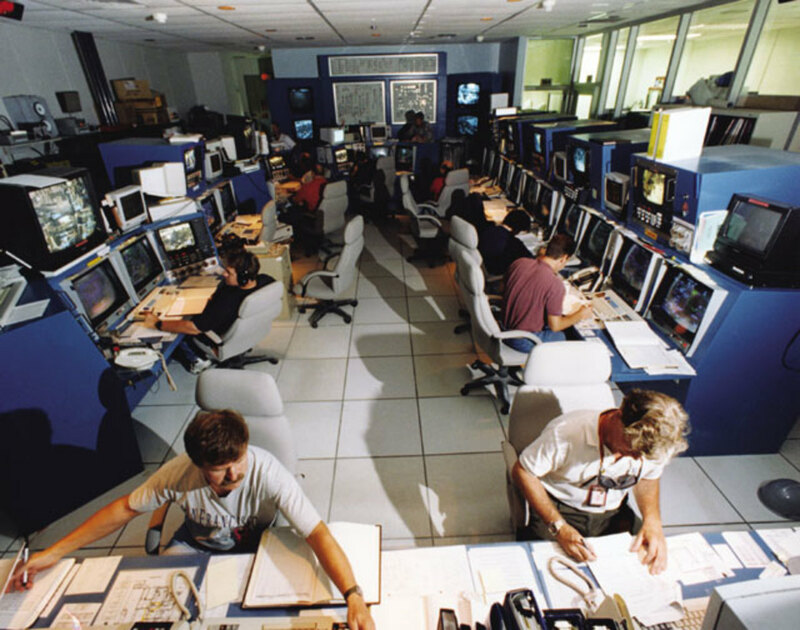 JACADS control room, as officials on Johnston Atoll use computer power to monitor and control the disposal of chemical weapons. Image courtesy U.S. Army Chemical Materials Agency and Wikipedia. hotels past the green marker signs. That's the heart of the country. . .
As with winged transport, so with wheeled, as the personal automobile transformed not only life, but the very landscape; and as with transportation, so with devices for communication, efficiency and convenience, from the widespread adoption of the telephone, the refrigerator, and eventually the personal computer. 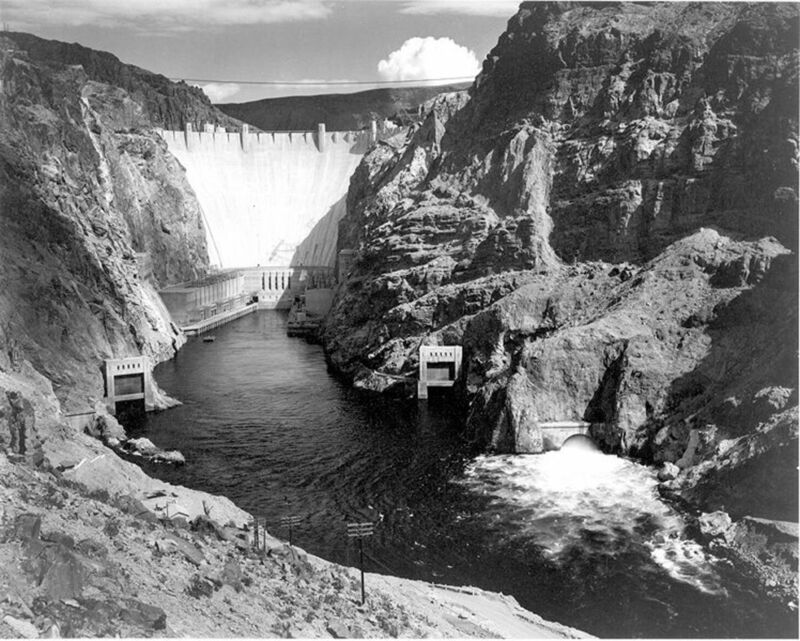 Ansel Adams photo of Boulder Dam, now the world's 35th-largest hydro-electric dam (and now called "Hoover Dam.") Image courtesy the National Parks Service and Wikipedia. 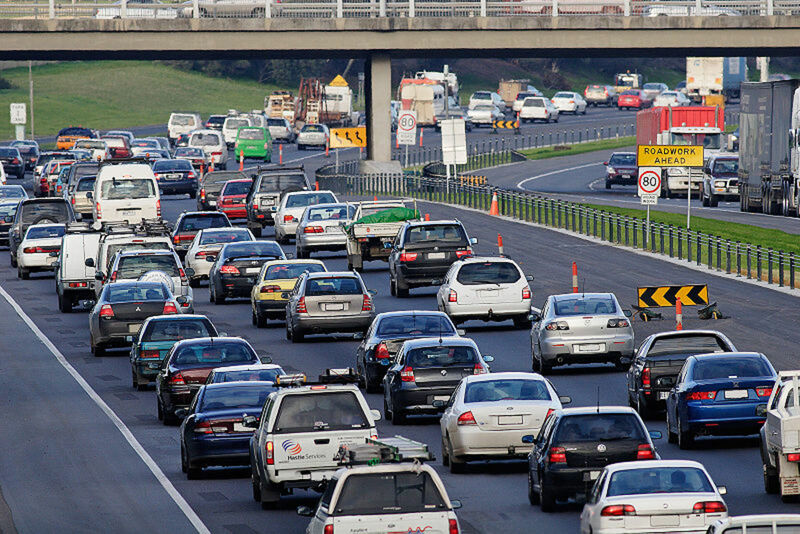 The common denominator of all of this was what has come to be called "carbon footprint." Whether it was jet fuel or gasoline burnt and exhausted to the atmosphere, coal burnt to produce electricity, or even the millions of cubic meters of concrete used to build hydroelectric dams, the hallmark of twentieth-century development was an increased carbon footprint. Arrhenius had anticipated that emissions would increase, of course. 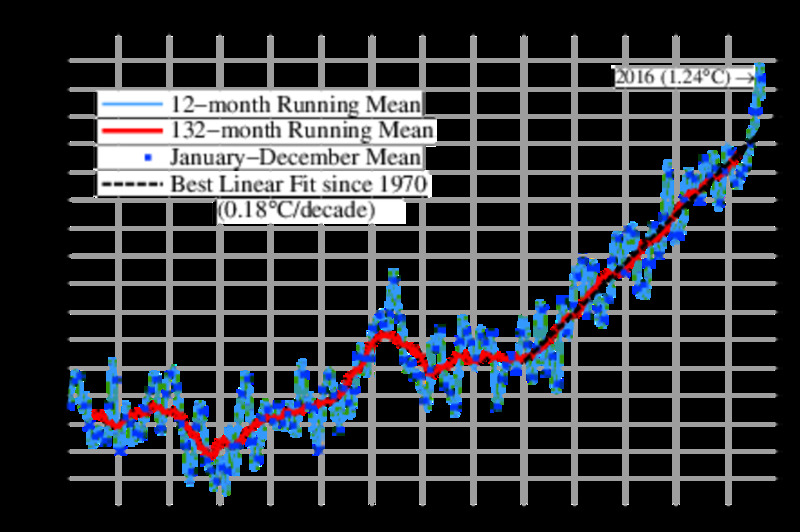 But neither he, nor researchers in the next few subsequent decades, could have anticipated that the increase would prove to be exponential, as the graph below shows it to have been. 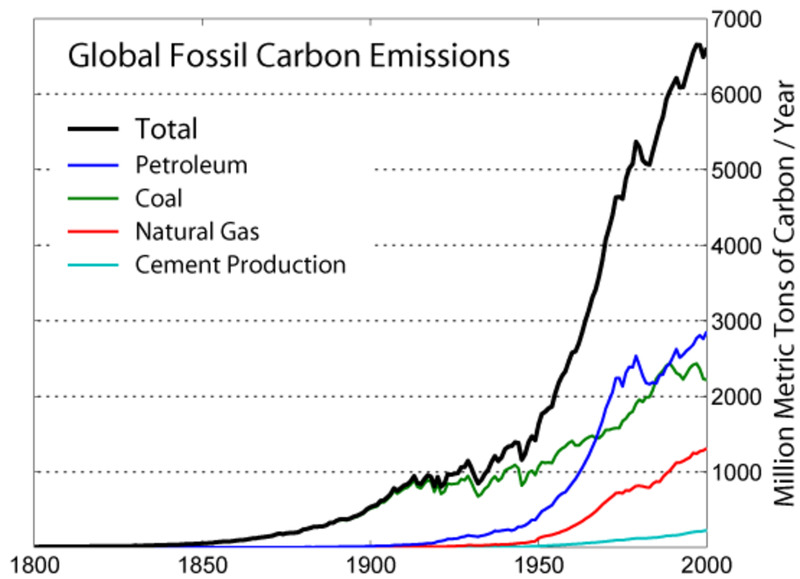 A Brief History of Global Carbon Emissions. 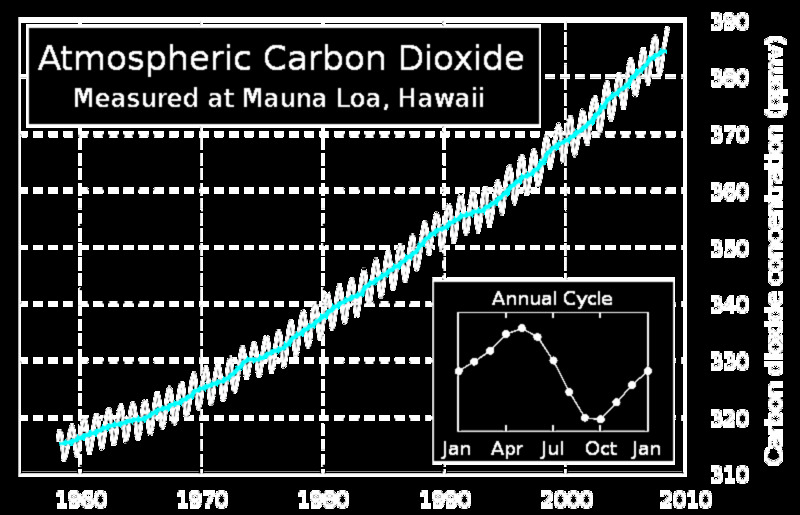 As of August 2009, the CO2 concentration of the atmosphere was measured to be 385.92 parts per million. (The pre-Industrial value--relatively stable for thousands of years--varied between 260 and 280 ppm.) Rigorous, high-precision measurements have been made at Mauna Loa since 1958, and at other locations more recently. The record of the Mauna Loa observations is commonly known as the "Keeling Curve," after David Keeling, to whose curiosity, drive, passion for precision and sheer tenacity we owe this record. How Svante Arrhenius would have enjoyed having this data to play with! Kidding, a bit, but there really is more. One of Arrhenius's closest and most prolific scientific collaborators was Nils Ekholm--a scientist with a particularly fascinating story. Check it out at Global Warming Science, Press, And Storms. The history of research on climate change from the 19th century to the present, told in a set of hyperlinked essays. Indispensable. This Hub is fourth in a series, preceded by "Global Warming Science In The Age Of Queen Victoria." It recounts the life, work and times of the iconic John Tyndall--the first solo climber to summit Monte Rosa, and the first scientist to measure the greenhouse properties of water vapor and carbon dioxide. Or go right back to the beginning. Arguably the first scientific papers laying the groundwork for global warming science were the work of brilliant mathematician, and Napoleonic official, Joseph Fourier. Read about his life, work, and times in the first of these "Science of Global Warming" Hubs. Print version of the essential hyper-linked online source by physicist Spencer Weart. Thanks. Great stuff. Now going over to check out Ekholm. Thanks, Neven! I didn't think about the sinister sense of "manipulate" when I wrote that! Of course, as you know but not everyone realizes, manipulation in that sense will be revealed in the normal course of the scientific process, as a paper must be independently replicated to really "count," and the replications will show up such problems. Yes, there will be more such articles. I hope this month to get one out on a 1900 paper by Arrhenius' buddy, Nils Ekholm. We'll see if I make that target! Great stuff, Doc. 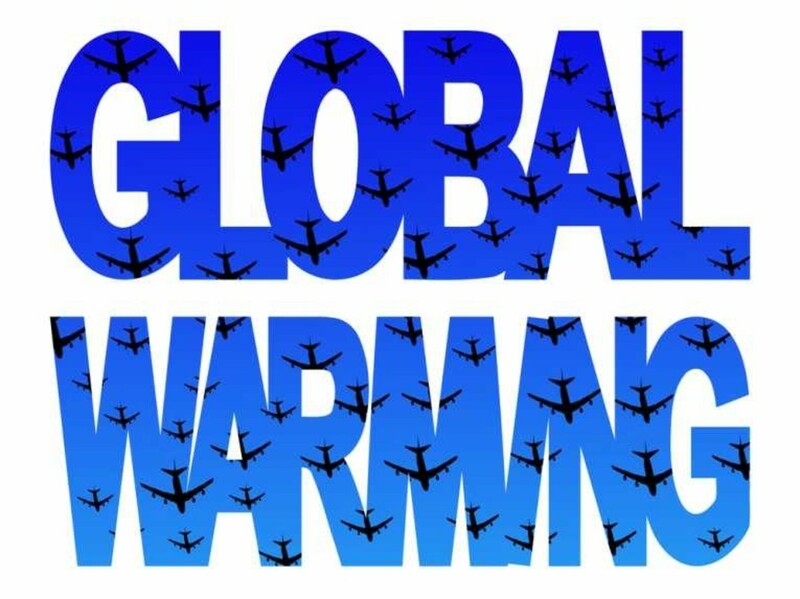 I really like how you tied Global Warming and aviation back together at the end. "The younger Svante had either developed or inherited a great facility in remembering, MANIPULATING, and understanding numerical representations of real-world phenomena." Will you be writing more pieces on key figures in the history of climate science? I sure hope so. Thanks again.